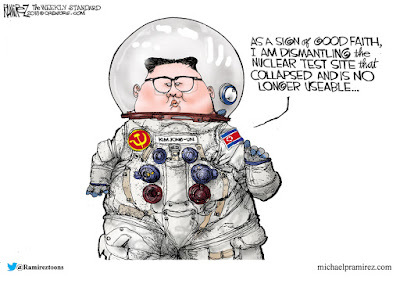 The fat kid with the bad haircut (Little Rocket Man) wants the world to respect him. Those expectations of some Americans are a long way from being realized. The Democrats seem to cherish him, but they also cherish the murderous savage members of the MS-13 gang, and they work hard to insure that millions of babies are killed in utero every single year (it's how they roll). Nork generals, shot callers and power brokers do not stand to benefit from new peace arrangements with the free world. They have all of the luxury items that their hearts desire now. And as with many privileged classes in countries run by tyrants, it can only go downhill from here. As a result, the rhetoric against the US is ramping up inside North Korea, the Hermit Kingdom, on the eve of potential peace talks. Kim Jong Un, who was raised in Europe, may want to see some movement away from the decaying, backward nation that he runs, and to improve things. Irrespective, that is likely not the opinion of the elite class who like things the way that they are. The filthy truth about the Obama White House and its efforts to spy on the Trump Campaign (false information to obtain FISA warrants, spies embedded with the campaign, 'unmasking' of names on information collected to discredit members of the campaign) make the country look more like a banana republic every single day. Democrats should worry because if this becomes the way we do things, there is nothing stopping the current Republican administration from weaponizing the government against them. The point is that the investigation of the corrupt, elite FBI needs to proceed to a grand jury, and from there to OPEN COURT where the criminal trial needs to be televised. I'm not suggesting that it should be a guillotine event, but unless people are held accountable, it will continue, and will likely get worse. Spike Lee produces and directs films that few people see, but he's celebrated because of his race in much the same way as some other under achievers are. Rep. Maxine Waters (D-CA) comes to mind. He was a big supporter of Donald Trump until the Democrat machine (which runs the plantation where he lives) decided to have him ramp up his rhetoric against the President. He's been spewing some hate filled talk about how President Trump is worse than Hitler recently in public. When you think about the state of the economy, the tax breaks to small businesses and the low unemployment numbers - particularly among minorities, you'd think that Spike would be up at the microphone praising President Trump for his accomplishments. But that's not the case. He's out, spewing hate and Democrat talking points that he knows to be false. 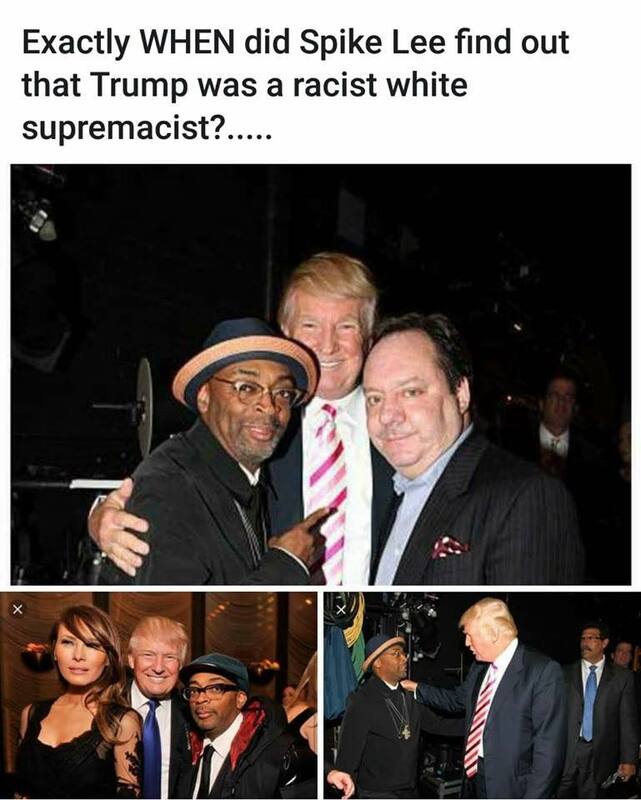 The truth is that Spike Lee is a bigger whore than Stormy Daniels every thought of being. Sorry Spike, you're a pathetic excuse. Opium and the politics of opium has dominated Afghanistan for a very long time. It's also the principal cash crop of the Kurds (American allies in Syria and Iraq). Therefore, while we wage a war on opiates at home in the US, we support the production of opium in the Middle East and the Asian Subcontinent by not destroying the crops - many of which are produced by our allies. It's not a new story. 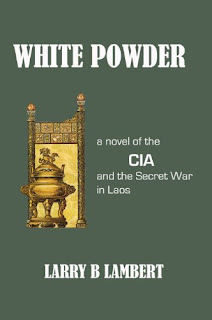 And it may be time to shamelessly plug my book, "White Powder: A Novel of the CIA and the Secret War in Laos". The vast bulk of heroin that hits the street in the USA today comes from Latin America (it must be somewhere around 95%+). Much of it is grown in Guatemala, Honduras and Southern Mexico. So while Afghan/Thai/Myanmar/Kurdish/Laotian heroin is a problem, it's more of a problem to Asia than it is to the US. The Mexicans control distribution (by in large) in the US. Afghanistan produced a record opium poppy harvest in 2017. On 21 May, the UN Office on Drugs and Crime (UNODC) released its latest report on opium poppy production in Afghanistan. It also produced a shorter summary of key points in the report. Virtual Mirage (your favorite blog) reproduced excerpts from the UNODC report’s executive summary and analytical comments from the UNODC’s separate summary of the report for your consumption. UNODC analysis: Potential heroin production is unprecedented. “Last year's record levels of production led to unprecedented levels of potential heroin production. From the 2017 opium harvest, some 550-900 tons of heroin of export quality (purity between 50 and 70 per cent) can be produced. UNODC analysis: The illegal economy rapidly expanded. With a value of up to 32 per cent of Afghanistan’s GDP, opium poppy is a lucrative cash crop. It has become a crucial component of the Afghan economy that secures the livelihoods of many Afghans who engage in cultivation, work on poppy fields or partake in the illicit drug trade. Opium poppy cultivation is labor intensive. In 2017 it provided up to 354,000 full time jobs just for weeding and tending the fields. UNODC Report excerpt. “The income earned at the farm-gate supported the wider, licit rural economy. Afghan farmers purchase food, have medical expenses, and purchase daily needs products. These expenses - paid from opium money - benefited local bakers, butchers and other small-scale businesses in rural Afghanistan. Opiates have thus created an illegal economy that has permeated the rural society to the extent that many communities – not only farmers – have become dependent on the income from opium poppy to sustain their livelihoods. Comment: The illegal rural economy supports the legal rural economy. UNODC analysis: It is grown throughout the country. In the Western and Northern regions, farmers cultivated poppy in more than a third of the villages; in the Eastern region in more than 50 per cent and in the Southern region in almost 85 per cent of villages. In addition to farming households, opium provides access to daily wage labor to a large number of local and migrant workers hired by farmers. In 2017, opium poppy weeding and harvesting provided the equivalent of up to 354,000 full time jobs to rural areas. Wages from poppy cultivation support all the essential services of village life, including bakers, butchers, local clinics and small businesses. The Afghan Ministry of Counter-Narcotics (MCN)/UNODC estimated that in 2017, insurgency groups, including the Taliban, accrued a minimum of US$ 116 - 184 million from taxing the opiate production in Afghanistan. Comment: The quarterly report by the Special Inspector General for Afghanistan’s Reconstruction that was published last month judged that the security situation worsened somewhat, compared to conditions a year ago. The UNODC report adds another perspective. The extent of poppy cultivation has evolved into a critical component of village life. All essential services in the village are financed by the wages from poppy cultivation. In this system, destroying poppy crops is the same as destroying general village livelihood. The ripple effects from eradication reach the entire village, including any security people who receive bribes to augment their salaries. Poppy culture has evolved into an important measure of Taliban influence. It was not always the case because the Taliban banned poppy cultivation when Mullah Omar ruled in Kabul. When driven from power, the Taliban came to rely on it to finance their uprising. Poppy cultivation information puts new light on discussions of the area of government or Taliban control. When an area is controlled or influenced by the Taliban that seems to mean that poppy cultivation flourishes openly. In areas influenced by the government, that seems to mean poppy cultivation is largely ignored. With opium poppy cultivation contributing up to one third of GDP, involving a minimum of a third of the villages plus providing a third of a million wage-paying jobs, this crop is ineradicable without further impoverishing Afghanistan. The Taliban are not just fighting for a different government. They are fighting for the livelihood of more than half of the farm villages in Afghanistan.